In the last 3 months my ‘Hiring, Motivating and Retaining Millennials’ workshop has been my most popular program. I’ve trained at a few companies and spoken at a golf conference, a long-term care conference and even a heavy machinery conference. No matter who my audience is, one of the most frequent questions I’m asked is, “How do I get the best out of Millennials and keep them more than 18 months“. It’s a great question. There are many concerned leaders who believe Millennials are only ‘marginally motivated’ when it comes to their work. That’s what I would like to address over the next few minutes. My goal is to share three key reasons why I believe Millennials are marginally motivated at work. Some Millennials take jobs that are not in their chosen profession. You may wonder, ‘Why would someone take work they don’t really want?’ The simple truth is many Millennials may need the money, or they may be tired of looking for work, or perhaps they want to make sure there isn’t a gap in their resume. There are many reasons why a Millennial might compromise, and whatever the reason, it is not good for you or for them. If your new Millennial employee feels they are compromising (and my Millennial At Work Survey research says that many Millennials feel they have to compromise), it’s not surprising that during that time with you they will be ‘Marginally Motivated’ and you’ll only get 50%, 60% or perhaps 70% of their effort. In addition, it should not surprising that they keep looking for work they really do want. This is why it is critical to hire the right people. When you hire people whose career goals and personal values reflect the work and your corporate values, you will have engaged employees. When you use a hiring process that is measurable, accountable and reliable, you will have lower-than-average turnover and lower-than-average training expenses. In addition, all of your other success indicators will move in the right direction. If you are not using a formal hiring process it’s like gambling in Las Vegas… it’s risky, based on chance and will likely be expensive when you lose. Millennials want to be respected and valued. They also want to feel they are making a contribution and want professional development opportunities. Lets face it, we all excel when we are respected, valued and feel we are making a contribution. You know that when you love something you spend lots of time doing it… you many even volunteer to do more of it. The difference between Millennials and everyone else is that if a Millennial doesn’t feel they are growing / acquiring new skills or making a difference, they quickly feel frustrated and lose interest… which is why people think they are ‘Marginally Motivated’. And, because many parents of Millennials have not done a great job of teaching their kids patience, even if Millennials are working in their chosen profession, when they feel frustrated you will begin to have a retention problem. NOTE: Millennials are life-long learners – these are values their Boomer and Gen X parents instilled in them. Millennials see work as part of their whole life, something they want to enjoy and is / will be something that fulfills them. Millennials want their work to be meaningful and even (for many), a place where they make friends with their co-workers / leaders. Millennials also perform better when they are given frequent, positive reinforcement / encouragement. Giving frequent reward and motivation to each employee isn’t ‘natural’ for Boomers. For 30 plus years Baby Boomers were the primary employment market. In addition (and this is critically important), for the most part each of them shared very similar goals. Generally speaking, Boomers never thought of work as a place to fulfill their passions. Boomers wanted stability; they didn’t want to take risks (and since change equals risk… it was bad). What Boomers wanted was mutual loyalty, to pay their mortgage and to collect wealth (which would give them even more stability). Very few Millennials share these values – for now at least. Does this sound like too much effort? I hope not. Employers can only insulate themselves from Millennials (and the upcoming Gen Z), for so long. Soon, most of the Boomers will have retired and the largest workforce will be Millennials. In case you don’t sense it, I do believe Millennials are hard-working, creative and loyal as long as we hire the right Millennial and support them / motivate them in the way that meets their individual, personal and professional goals. And, while they do want to be loyal, they do not expect to work for one company their whole career. The benefits of hiring Millennials and motivating them as unique individuals is tremendously profitable. And this holds true for people of all generations. When a company is able to keep highly motivated employees (not marginally motivated employees), for five or more years instead of the two years so many employers are experiencing… and even expecting… it translates into a great pay-off (and saving), for the company AND a great learning experience for each employee. Happy communicating, mentoring, motivating, coaching… and training. Click here to learn more about Bruce Mayhew Consulting. We facilitate training courses and speak on a number of topics including email etiquette, time management, leadership, generational differences and more. Wouldn’t it be nice to have employees motivate themselves? Helping employees exercise independence (point #4 above), is a scary concept for some organizations; they fear no work will get done. On the contrary… most of the time. Of course, a balance between autonomy and accountability must be outlined and agreed upon. Once that balance is agreed upon, when employees are Intrinsically motivated they will be engaged, work harder, work longer and be more creative. When employees are Intrinsically motivated they will be happier. When employees are Intrinsically motivated no one needs to be worrying about work quality. Personal pride is a wonderful motivator. Here are 4 ways you can help your employees motivate themselves. The first opportunity is a best practice that is as old as the hills (as my dad would say), but it works. Encourage employees to break projects and/or long-term goals into smaller manageable chunks. Why does this work? Breaking projects into smaller projects lets people feel they are accomplishing things frequently. Big projects can feel overwhelming… especially when we are working on multiple big projects / priorities at the same time. Smaller chunks of work also have the wonderful advantage of helping us mentor junior employees; for example, smaller projects can be explained and delegated to Millennials who want to gain experience. A word of caution, do not lose sight of the main project goals. We can sometimes get too involved in the details of the smaller project and this might compromise the success of the large project. See mistakes as learning opportunities. A positive and supportive work environment will always improve employee effectiveness. We all make mistakes. Let me say it again… we all make mistakes, and we have a choice to point fingers at who may be to blame (if there ever is only one person), or we can see mistakes as opportunities to be even more creative, to try something different and/or learn a new approach. Trust and respect are huge when it comes to self-motivation and group motivation. Why does this work? When we are scared to try something new – when we blame ourselves or others for mistakes, we risk locking ourselves into ‘how we’ve always done it’. If you stand still you can be sure there is some other organization that will innovate right past you. Positive thoughts inspire us – negative thoughts can pull us down… so, evaluate mistakes as learning opportunities. Surround yourself with positive people. This doesn’t mean you have to spend time with happy, bubbly people 7/24; that would be annoying. Why does this work? When we stay positive we feel better and are often more creative and more productive. When we stay positive we evolve. The more you focus on being positive – in life and at work, the more you will motivate yourself to passionately focus on your goals. Even during difficulty, positive people are looking for solutions – not holding a grudge. People who see the glass as half-full are so much easier to be around. Negative thinking is unpleasant to be around and your best employees might quit just to get away from it. This means you might be losing valuable talent for no good reason. By encouraging a positive approach you’ll soon see your work environment will become a happy, creative and productive place! Write in a Journal. I know – I know… you just rolled your eyes. Please try to write in a journal every day – even if it is only a short paragraph while you sit having breakfast, on the Go-Train or when you have a private moment. Why does this work? By writing you get to explore feelings you might be holding back… and I bet you will come up with the best solutions. You’ll also begin recognizing how many wonderful experiences you have each day and that some of your challenges aren’t so big – or aren’t so important. By keeping a journal you’ll be building a more positive mindset and you’ll find yourself more motivated and look forward to what’s in store for you. Keep track of your thoughts and feelings. Most importantly, each day write down two things you are happy or excited about. If you are looking to create change in your organization – lasting change – look to how you can help your employees motivate themselves. In fact, when people experience self-motivation they will likely do more… do it better… and finish earlier. You and your employees will not be able to adopt these habits overnight… but with consistent, positive attention, before you know it these 4 ways will start making a difference. I promise. Clearly this gentleman has had some bad experiences. I understand his frustration but do not agree; therefore, to help explain the work ethics of Millennials I responded to him by sharing 4 Best Practices on how to motivate Millennials. Because I have more room in this blog post, I’ve taken the liberty to elaborate and to include 7 Best Practices. Thank you for your feedback (name removed for privacy). I don’t doubt you’ve had some challenging experiences. I think everyone has ran into a Millennial who did not perform well. I have to balance the scale however and say that as a Boomer – I’ve worked with Boomers, Gen Xers and Millennials who have fallen short of my expectations. I’ve also worked with Boomers, Gen Xers and Millennials who have been amazingly hard-working, creative, devoted and who have sincere work ethics. Make sure Millennials know the company mission, vision and values. This provides meaning to the employee. All employees – but especially Millennials are looking to take pride in their work as well as the company they work for. Sharing the companies value-based mission, vision and values and how you support your community as good corporate citizens will help the individual employee be motivated and engaged. Make sure you hire a Millennial whose interests and talents match the work. As they gain experience you might need to restructure their job to keep them engaged and learning new things. Two, three or four years in the same job will be torture for most Millennials (Gen Xers and Boomers). If they have talent you want – think about how to keep it. Perhaps job-sharing or cross-training is an option. NOTE: Millennials love to mentor others… and this enhances their leadership skills. Millennials enjoy being friendly with the people they work with including regular customers and suppliers. So, focus on relationships to keep things interesting for them. Find ways to have fun and build camaraderie. Perhaps take advantage of how socially responsible they are and have them take a leadership role in developing a fundraising event to support a local charity. A growing popular opportunity is to provide Millennials (and all employees), time to work on self-defined projects. This good for the company and the employee as it helps the employee feel more engaged and in control and boosts creativity and innovation within the company. Another must-have for Millennials (and some Gen Xers and Boomers like it also), is to offer ‘respectful’ flexibility. Being able to work from home one day a week – or come in late / early will be seen as a great motivator for many… and add to their loyalty to your company. Millennials do better with very regular evaluation and feedback; this helps keep them motivated and on the right path. You don’t need to make a big big deal about it – letting them know verbally or with a short, handwritten note will let them know you care enough to notice… so will work well. Treat them like adults. But be sure they know this means taking responsibility for successes and failures. Work with them to identify goals – timelines – and establish set times to mentor them. Remember – their strengths are knowledge not 25 years of experience. They are energetic, creative, technically savvy; they are also a fresh perspective. Give them a goal and then come up with ideas on how they’ll do it. If they suggest a way that will work within budget – but it is feasible… let them go with it… even if it isn’t the way you would do it. Millennials want work and work/life balance that most of us would want… no matter how old we are. Millennials want meaningful work that expresses their needs, values, talents and desire to learn. That doesn’t sound like unrealistic work ethics… in fact it sounds quite normal. The challenge is because Millennials rarely hold back (they were taught not to), they are going to actively pursue the career and the work/life balance they want. It’s not that they are not loyal – they are… and they will stay with your organization as long as their needs are being met. You might be interested in my recent blog post called Baby Boomers And Millennials Are Alike. Happy communicating and creating workplace harmony. Look around most offices. In most, there is a mix of at least three generations – all with very different work / life values and motivators. This multigenerational workforce is the new norm. And because of this multigenerational mix, organizational leaders must break with traditional thinking that money is the ultimate reward and the organizational structure follows a hierarchy. For the last 30-50 years leaders were able to rely on the knowledge – the truth – that most people from the same generation and cultural background share similar motivators and values. Leaders were able to rely on this because most of the North American workforce was made up of Anglo-Saxon Baby Boomers. Today, we are experiencing a wonderful and expanding multigenerational and multicultural workforce. In the next few years half of our eligible workers will be Millennials. In addition, many Boomers are not retiring (because they have to keep working, or they find work fulfilling), and early Generation Z employees are also now entering the workforce. What this means is that leaders will need to help employees from all generations learn how to communicate with… and motivate each other. When multigenerational communication works, respect, loyalty and personal / organizational success flourishes. The organization that succeeds helps it’s employees recognize the value each generation offers and creates thriving, respectable teams. 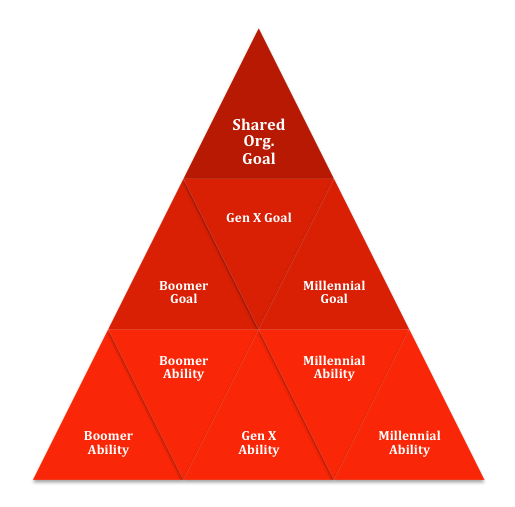 Successful organizations understand each individual can (and should), express their unique talents and personal goals as they focus – together – on shared organizational goals. Will there be a bonus for a successful upgrade delivered on time? Might this lead to a promotion? Will there be sincere recognition for meeting deliverables (from their boss is usually OK – or could be something bigger like within the company newsletter)? How can they uniquely contribute to the project? What are they going to learn? Who are they going to meet? What might be the next opportunity that this opportunity leads to? In a multigenerational workplace we need to give our employees / teams the tools, motivation and knowledge to build honest, respectful relationships based on ability (skill, knowledge and experience), and goals. Boomers are traditionally motivated by money and status like office location, attending events and being the boss. Xers are the first generation to focus on work / life balance – they saw their parents who were very loyal to one company 20 or 30 years get laid off. Millennials want more work/life balance, freedom and opportunity. They are driven by a desire to better themselves, get recognition for and share their successes and to do meaningful work. To manage across the generations we have to learn to be mindful of each other and treat each other as individuals. No matter what generation we are from, it’s too easy to keep doing what we are doing now and acting like each generation is (or should be), motivated by the same things we are. Even if our professional – management instincts say “no – of course we don’t do this,” we have to be careful that our actions don’t demonstrate that we do. We always have to be mindful of our actions and stay open to listening to each other. Use everyone’s ability and goals. Take advantage of this opportunity to increase corporate profitability, customer satisfaction, employee satisfaction and employee loyalty. Hold onto our old ways and try to force… basically a square peg in a round hole? For organizations to be successful, one important part of the equation is to find and keep individuals who consistently give maximum contribution. Employees from all generations including Millennials will perform “consistently well” if they “Feel” consistently motivated and appreciated. Force is not an option; force will only make your workforce quit – or if they can’t quit… they will stay and check-out which is worse. This is worse because you are still paying them, their productivity drops and they will likely develop (and share), attitudes that negatively impact everyone else. For years employee motivation has been straight forward – Baby Boomers have worked with other Boomers… people who have all similar work/life values and approaches. For the most part they value hard work, paying your dues, good salaries, hierarchy and time in the office. Even when Generation Xers (roughly 2/3 the population size of Boomers), showed up things remained OK. Why? Because while Gen Xer values and approaches are different from Boomers (and Gen X did push certain employee engagement boundaries), they are also a very resourceful population and quickly figured out how to work in a Boomer dominated world. Now Millennials are entering the workforce… and this is the opportunity… or the threat. Millennials or Generation Y are ambitions, well educated and have always been encouraged by their Baby Boomer and Generation X parents to strive for more, be creative, learn and not settle… especially if it goes against what they think they want (and we’ve told them they can have anything). Millennials are also roughly the same population size of Boomers. And according to Time Magazine, by 2025 three out of four workers worldwide will be Millennials. How To Positively Impact Employee Engagement? Meet their individual, unique needs that to satisfy their unique path to success. It’s only when their employer consistently meets their values and personal goals, these Millennials will consistently demonstrate employee engagement and employee loyalty. This process doesn’t mean tones of work – in fact in the long run it can mean less work and cost vs. training and retraining employees that get frustrated and quit. To have your employees want to consistently give maximum contribution, managers need to have one-on-one conversations… treating them as individuals and consistently addressing their personal and professional goals (including Gen X and Boomers). For Millennials this means consistently addressing employee engagement goals that are important to them including travel, flexibility, continuous learning, self-expression and knowing how their work impacts the bigger picture. When your team members understand their own and each others communication, mentoring and reward preferences, they can then focus on where they can add the most value based on talent, interest and individual / corporate need. The result is greater employee engagement, better team dynamics and productivity, greater employee loyalty resulting in lower turnover, and fewer conflicts to resolve. Employee engagement; Develop Your Human Capital to Boost Growth and Efficiency. Every workforce is fluid so employee engagement is something we have to work on every day – it will be part of daily meetings, feedback sessions, planning, project management, brainstorming sessions, and compensation and performance reviews – everything. Addressing the needs of your multigenerational workforce will catapult employee engagement and performance in a way that will lead to individual and corporate success.